About a decade ago [Windell Oskay] and [Lenore Edman] spun out of Evil Mad Scientist Laboratories to work on CandyFab, an inexpensive 3D printer that used sugar as its medium. Wondering what happened to CandyFab? It’s been nearly that long since we last wrote about their work and Maker technology has moved on; nowadays 3D printers run the gamut from very inexpensive to production ready. The CandyFab project and nascent company are now shuttered, but there is a epilogue with some interesting lessons. First of all, the saga of the CandyFab series of printers (above on the same page) is worth a read. Some of what these machines were capable of is still quite impressive by modern standards. Sure your Monoprice Mini Delta may be easy to use, fully assembled, functional when you take it out of the box, and quiet. But what if you need to print something up to 8.5″ x 11″ x 17″? The CandyFab 5000 can do that. Or even a humongous 24″ x 13.5″ x 9″? The CandyFab 4000 can do it, and for a measly $37 (if you printed a solid cube exactly the size of the build volume)! Sugar may have downsides but it’s still a pretty clever medium for some uses. CandyFab credits the rise of MakerBot coupled with the complexity of iterating from a pile of “surplus junk” (their words) to something kitable. Reading their post-mortem brings to mind familiar problems from today’s hardware world. A spike of fantastic early publicity lead to the need to handle press while rapidly iterating from the aforementioned surplus parts to a reliable and manufacturable design. Then the complexity of balancing a day job and other side projects with the prospect of CandyFab as a business. Ultimately the need for the project in the first place (accessible inexpensive 3D printers) was alleviated by the market and the project came to a graceful close. Give the post a read, we’re sure you’ll learn something! [Adric Menning] has an unfortunate allergy. He’s allergic to chocolate. Instead of eating the stuff, he’s using it to build model rocket engines. 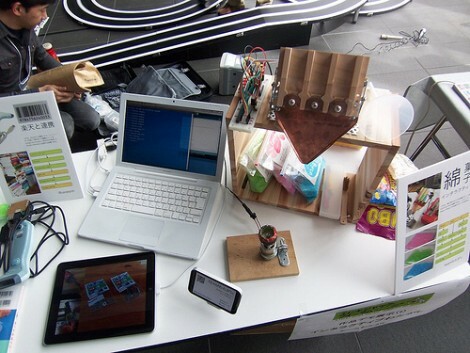 The project stems from the Quelab Hackerspace’s chocolate hacking challenge which spawned a number of interesting hacks. [Adric’s] doesn’t use pure chocolate (an experiment with a Hershey’s bar was a bust) but manages to ignite using a Milky Way bar. This is not as unorthodox as you might think. Sugar and potassium nitrate have long been used to create solid rocket propellant. The chocolate version is swapping out plain old sugar for the candy bar. It was chopped into 10 gram chunks to make proportion calculations easier later on. The chunks go into the freezer to make them easier to grind using a mortar and pestle. Once it’s a somewhat chunk-free powder he mixes it with the potassium nitrate which previously had its own trip through the grinder. After being packed into a chunk of PVC pipe and fitted with an exhaust nozzle the engine is ready to go. You can check out the test-fire video after the break. There’s a burn restriction in his area due to drought so this is just an engine test and not an actual rocket launch. [Superluminal] received an invite to his friend’s wedding. He got together with some mutual acquaintances to take up a collection as a wedding gift. But as things go, a suitable present couldn’t be found. The pooled money itself ended up being the gift, but apparently a greeting card with a money pocket inside of it wasn’t good enough. The group decided to encase the coinage in a block of sugar that doubles as a lamp. Now as with many well-meaning projects this started out with a rendering of what the final product would look like. That image came out great, with a high-gloss dark amber cube lit from the bottom with the coins suspended throughout catching a bit of a glint. They bought 43kg (almost 100 pounds) of refined sugar, and made a base/mold combination out of sheet metal. A lot of induction cooking went into producing thick syrup that could be poured into the mold. The problem is the final product is basically opaque. Not a sign of the 300 Euros within. But don’t feel too bad for the groom and his bride. The image above shows him trying to get at the prize. 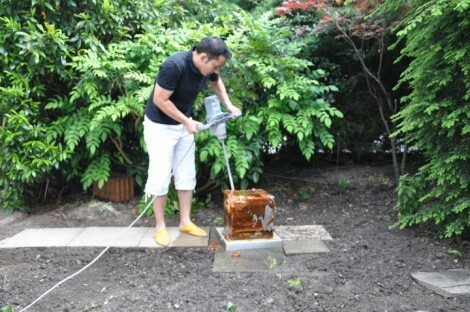 He must do some hacking himself because he has a pressure washer, jack hammer (or is that big drill? ), humongous cold chisel, and sizable hatch already at his disposal. We can’t help but wonder if a heat gun could have polished the sides of the cube and helped add translucence? [KoD] and [Navic] are building solid propellant motors using sugar and potassium nitrate. They cook up the two ingredients along with water and a bonding agent. They find that corn syrup is particularly good for bonding and that cooking the strange brew is more of an artform than science. Either way, the video after the break is proof of the dangers involved in this hobby. Testing the engine thrust with a bathroom scale ends badly for the scale. There is something satisfying about the ingenuity that goes into the materials. For a casing they’re using PVC pipe, and forming a cone to focus the thrust by using a what amounts to plumber’s epoxy putty. The capping agent for the finished motor is ground up kitty litter. This is an interesting read, but for now we’re going to stick to water rockets.